This WonderPana FreeArc XL Core Unit Kit from FotodioX includes a WonderPana FreeArc XL Core Unit designed to specifically fit the Sigma 14-24mm f/2.8 DG HSM Art lens, as well as a separately available WonderPana 8.0" Holder Bracket. Those items can be combined to allow for the convenient use of two 2.0mm thick filters measuring 7.9" wide, or one 2.0mm thick filter measuring 7.9" wide, along with one FotodioX 186mm round filter behind it. A compatible 186mm inner-pinch lens cap for 186mm FotodioX round filters is also provided. 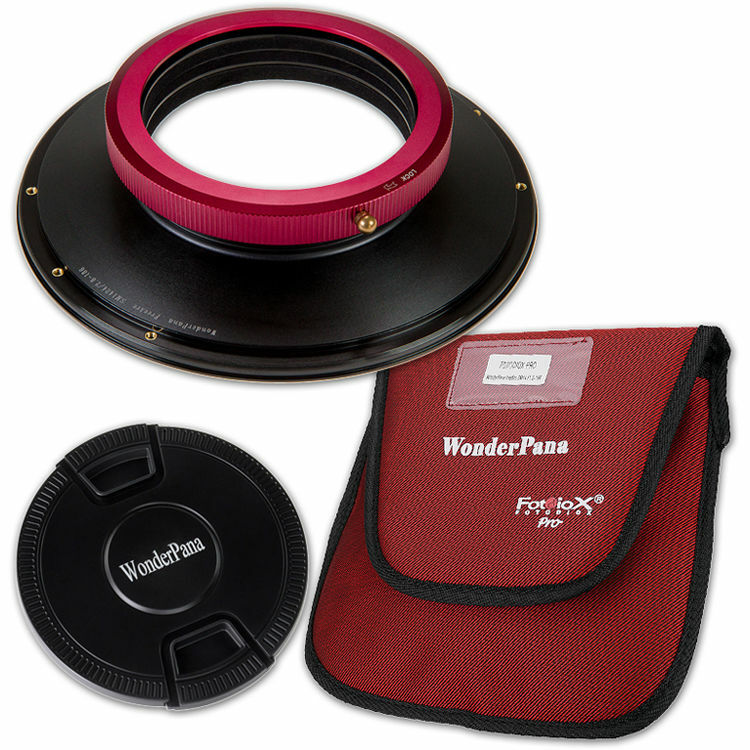 The included WonderPana FreeArc XL Core Unit consists of a compression front filter ring. Use of the WonderPana 8.0" Holder Bracket is easily accomplished by attaching its two assembly pieces to opposite sides of the FreeArc XL Core Unit using six of that holder bracket's eight included brass short-screws. Pre-tapped threaded inserts along the edge of the Core Unit accommodate those screws and ensure that the two assembly pieces are positioned parallel to each other and can hold a 7.9" wide filter between them. The combined holder bracket and front filter ring can then be attached to a Sigma 14-24mm f/2.8 DG HSM Art lens by tightening the Core Unit's locking mechanism. After being fitted onto a Sigma 14-24mm f/2.8 DG HSM Art lens, the bearing design of this WonderPana FreeArc XL Core Unit allows a WonderPana 8.0" Holder Bracket to be rotated 360°. This permits the use of graduated neutral density and other filters that are enhanced by varied positioning. A FotodioX WonderPana 8.0" Holder Bracket provides two pairs of filter slots, a configuration that accommodates two compatible rectangular filters. For each rectangular filter that is placed within one of the holder bracket's slots, its position is secured by integrated guides within each slot. These guides apply pressure along both sides of a filter that is sufficient to hold it in place, but permits movement of that filter. This can complement the use of graduated filters whose effect can be adjusted to better suit changing lighting conditions or creative demands by sliding them up or down within a filter slot. This FotodioX WonderPana FreeArc XL Core Unit includes front filter threads, which allow a FotodioX 186mm round filter to be used along with a WonderPana 8.0" Holder Bracket. If a 186mm round filter is used on the attached WonderPana FreeArc XL Core Unit, the rectangular filter slot closest to the rear of the holder bracket becomes unavailable. The FotodioX 186mm Center-Pinch Snap-On Lens Cap for Select WonderPana Systems and Filters is a 186mm front lens cap with a squeeze, spring, and snap-on mechanism. It is easy to install as well as remove and can attach to a WonderPana FreeArc XL filter holder system in order to protect the front element of a lens that any one of those systems is mounted on. Additionally, with the exception of the FotodioX Ultra Slim filters, this lens cap can be used to protect a FotodioX 186mm filter that is mounted on a FotodioX WonderPana FreeArc XL filter holder system. Box Dimensions (LxWxH) 9.8 x 9.8 x 3.1"